The Caf� Parisian flavored coffee is a truly divine brew. 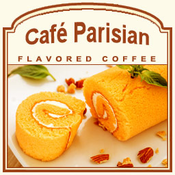 With a sweet, citrusy-orange flavor that mingles with a hint of Mexican liqueur and warm, creamy vanilla flavors, this Caf� Parisian is a mixture that will tantalize your senses and appease your taste buds. Made with 100% Arabica beans, this Caf� Parisian flavored coffee only has 2 calories per cup, which makes it a decadent indulgence. Sealed in a heat-sealed valve bag, this Caf� Parisian flavored coffee will be roasted and shipped on the same day. If you like a full-bodied flavor that offers you the smoothness of vanilla with a lively and brilliant citrus-infusion, look no further than the Caf� Parisian and its sophisticated taste.